Divers jumping into the water with no cylinder on their back can be found in images of vacationing divers, as well as in scientific journals. As is the norm in wreck and cave diving, sidemount equipment configuration is now being discovered by more and more divers. The simple, pleasant and weightless dive without the burden of the diving equipment to weigh down on the back - who wouldn't want to experience this? To make these kind of dives safely, it requires special training. Unfortunately, these dives are often carried out without the necessary preparation and knowledge, which often leads to a safety risk. Therefore, it is necessary to have the knowledge, skills and training to make Recreational Side Mount dives safely. You will learn everything about the background, history, benefits and equipment of sidemount diving. In practice, you will learn how to configure your equipment and manage it in the water, recognizing that bouyancy and movement brings you a new diving experience. 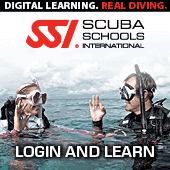 An SSI Recreational Sidemount course is made up of short academic sessions, with practice in the water to ensure comfort and safety with this new equipment configuration. With the proper training, you can enjoy recreational sidemount diving anytime. You can also learn other activities that work perfectly with Side Mount Recreational diving, such as other Specialty Course programs or SIDEMOUNT TECHNICAL WRECK DIVING as part of the Extended Range program. The possibilities are endless!